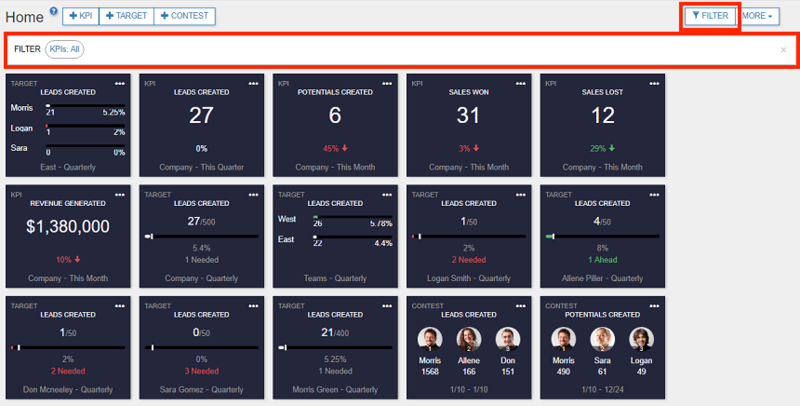 Dashboards provide a unified view of selected KPIs, targets, and contests, plus real-time indicators to highlight areas of interest. Various types of tiles can be placed in a dashboard. KPIs are metrics that sales managers can use to evaluate sales activities and results. 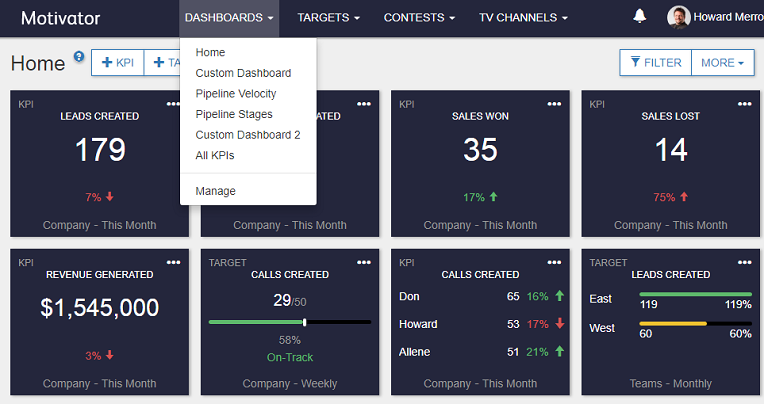 KPIs can be displayed as individual, team, and company totals or as leaderboards. Targets are goals you set to focus your team on key sales activities (e.g., lead creation, potential creation, etc.). 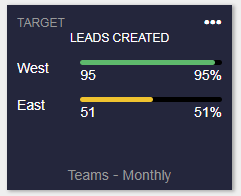 Targets can be displayed as individual, team, and company scorecards or as leaderboards. 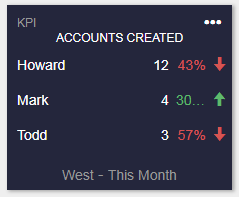 Leaderboards show the names and scores of the leading individuals or teams for specific KPI or target. To show the leaderboard, configure tile and select appropriate leaderboard in the People section. Contests are a fun way to energize your team around selected sales activities. Contest tiles display the top three leaders and their scores. Drag any tile on the dashboard to reorder. Click on any tile to see more details. Click Action Menu icon [...] in the top-right corner of any tile to show available options. Click +KPI, +TARGET, or +CONTEST button at the top of the page. Click Action Menu icon [...] in the top-right corner of each tile and select Change KPI/Target Filter. Select your desired configuration options. The options shown depend on the type of tile selected. Click Action Menu icon [...] in the top-right corner of the tile you want to hide. Click Action Menu icon [...] in the top-right corner of the tile you want to duplicate. 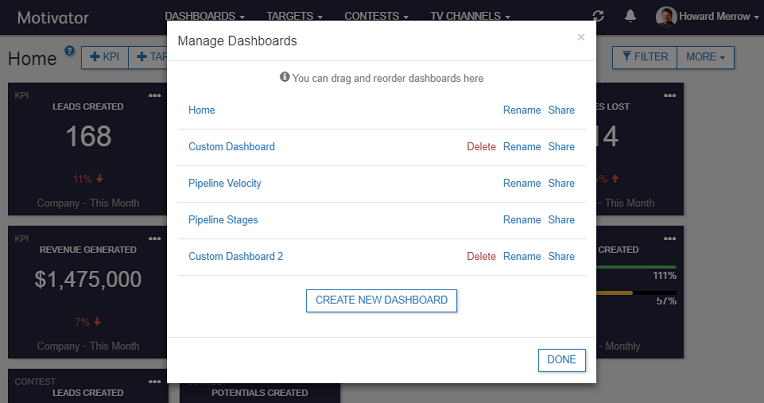 Select Remove KPI/Target/Contest from this Dashboard. 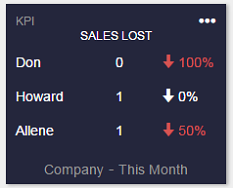 In the All KPIs dashboard, you can filter using an additional option (compared results). 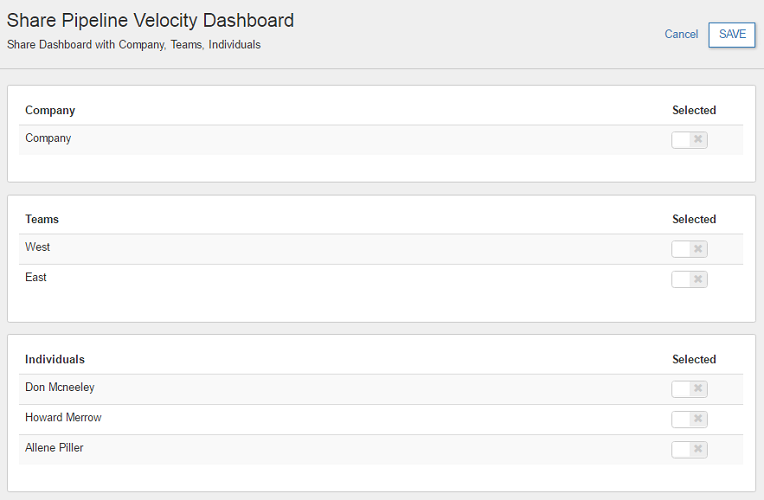 See Filter KPIs (in the All KPIs dashboard) for detail. Click FILTER button at the top right of the page. Once the filter is applied, the FILTER bar will appear above the tiles. To hide the FILTER bar, click x in the right. Select filter from the available options. 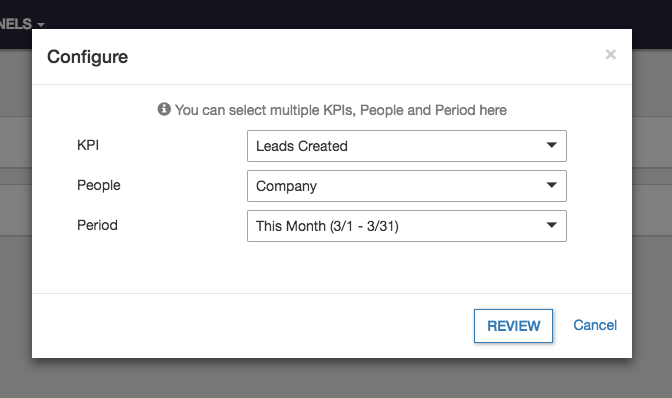 People: Select whose KPIs to show - company, teams, or individuals. Period: Select the duration of KPIs to show - daily/weekly/bi-weekly/monthly/quarterly/half yearly/yearly/custom period. Click DASHBOARDS button in the top navigation bar and select Manage. Enter the Dashboard Name, then click Save. Click MORE button at the top of the dashboard which you want to duplicate. Click Share button corresponding to the dashboard you want to share. Company: All active Motivator users. Team: Groups of active Motivator users (see Settings Help for more details on Team creation). Individuals: Individual active Motivator users. You can also click MORE button on the top to rename, share, or duplicate the dashboard.